To me, engagement sessions are one of the most joyful (and important) parts of planning your wedding. It’s likely the first time you will be in front of my camera together, which allows us to get to know each other. Plus, your session is the perfect time for you to relax and start to have fun in front of the camera. Knowing you will have a number of wonderful photos celebrating your engagement post-session to use throughout your wedding (save the dates!) is a total bonus too! I really can’t speak highly of these sessions enough, which is why I view them as an absolute MUST. 1. Think About Color: When deciding on your outfits’ color palettes, I always have a few suggestions. First, think about where your session will take place! If you’re planning to be photographed in an area that is “busy” in terms of color and pattern, neutrals are a wonderful option. However, if you’re planning a session in a park, any and all colors apply! Various shades of blue and even white compliment almost everyone, and I also always tell couples to wear the colors that make them feel most confident. If bright pink is your go-to, wear it! My other top tip is to consider patterns. If you or your fiancé are planning to wear a patterned shirt or dress, I always highly suggest the other person wear something more neutral so your looks aren’t competing. If your fiancé’s shirt is patterned, consider adding fun accessories (think: statement necklace, earrings, scarves, shoes, and more!). P.S: No one likes the matchy-matchy look! Make sure to show your personalities. 2. Consider The Season: While your wedding may occur in the summer, your engagement session may be scheduled for the fall or winter. Rather than wearing a summer outfit so your engagement style matches the season in which you will recite your vows, embrace the season you’re in! Try to steer clear of wearing summer styles in the middle of winter (and vice versa!). It never fails to look a little strange to see bare trees paired with a summer dress. Instead, think of your engagement as an adventure spanning many seasons. Each one deserves to be documented! 3. Think About What You Love: The time to try out a new style or trend is NOT during your engagement session! Being in front of the camera for your session may be one of the first times you have ever been photographed together professionally, and you might feel nervous. Adding a new trending style to the mix that is totally different than what you would normally wear likely won’t make you feel more confident. So, wear what you know you love! If you’re most comfortable and confident in a blouse and jeans, pair your favorites together and rock it! If you love wearing dresses and boots, go for it! Wear the pieces you know flatter your body best – sometimes the most popular trends or styles aren’t for everyone, and that’s okay! I’m counting down the days until I get to photograph you, not someone you’re pretending to be. P.S: Your family and friends want to see YOU in your photos, too! 4. Think About Your Engagement Session Location: Similar to all of the facts about choosing colors that compliment your location, I always encourage couples to dress for their location too! When I’m photographing a pair, I always scout the prettiest locations before you arrive. However, if I know you’re comfortable walking around an area, I may suggest checking out a few additional places. Wear a dress that makes you feel lovely (anything you can twirl in is always fun! ), but don’t wear shoes you’re not comfortable walking in. If we’re heading to a more modern space, don’t be afraid to dress more formally (it’s the perfect time to introduce your guests to your black tie attire)! 5. Think About Your Wedding's Style: You may opt to use your engagement photos for save-the-dates, and conveying a detail about your wedding's style is always something guests enjoy seeing. Wearing a black-tie gown when your wedding is far more casual may not convey the right message about your wedding and who you are as a couple, but wearing a flowing dress while walking through your favorite park offers a hint that your wedding will be formal and down-to-earth (a great combination!). Think of your engagement session as a wedding style sneak peek for you and your guests! I promise it will be fun and helpful. Bonus Tip: Always bring two outfits! I encourage couples to change during their session, which means we can photograph a formal and informal look together or simply swap colors in and out. Plus, options allows us to choose what will look best together. If you’re planning a Southeast Texas wedding, we need to chat! 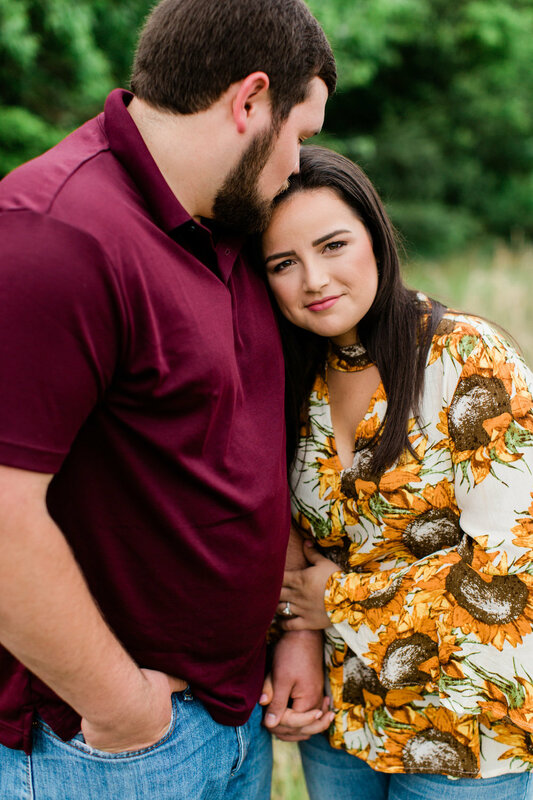 I’m already excited about hearing your story and planning all of the details that will tell your story best during your engagement session.